Log reduction & its calculation, sterility assurance level (SAL) & its requirement of 12 log reduction for sterilization and calculation of sterilization time. Sterilization of pharmaceutical articles is affected by a lot of factors as temperature, the population of microbes, the quantity of material, sterilization exposure time etc. Log reduction plays important role in the sterilization process. 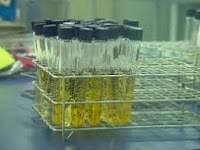 It shows the potential of the sterilization process. One log reduction shows the decrease in microbial population by 10 times. It means if a solution has 100 cfu, after 1 log reduction it will have 10 cfu and 1 cfu after 2 log reduction. It is 90% reduction in a specified microbial population. The time (in minutes) required to achieve 1 log reduction (at a specified temperature) is called D-value. Generally, in sterilization, it is required to achieve a SAL (sterility assurance level) of 106 and an additional 6 log reduction. It means all 106 (one million) organisms present in the material are killed effectively and assured by extra 6 log reduction. Hence total 12 log reduction is required. In 6 log reduction the microbial population shall be reduced from 106 to 1 and in other 6 log reduction population shall be reduced to 0.000001 that assures the sterility of the sterilized material. For example, if a material has a bioburden of 540 cfu then to reduce the microbial population from 540 to 1 = log (540) = 2.73. It shows that only 2.73 log reduction is required to decrease the microbial population from 540 to 1. Total log reduction required for sterilization of the material with SAL value of 106 = 2.73+6 = 8.73. Total sterilization time at 121°C with D- value of 2.5 min/log shall be 2.5x8.73 = 21.82 minutes. In a pharmaceutical sterilization with 6 log SAL where 12 log reduction is required, sterilization time should be 2.5x12 = 30 minutes. Most of the biological indicators have a population of 106 spores and 6 log reduction is required to reduce the population to 1. Another 6 log reduction is required for SAL value of 106.